You can also use checklists for exercise regimens, traveling, weekly reviews, clients, year-end activities, etc. 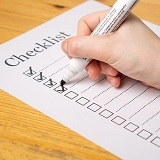 These checklists will ensure that you complete the tasks you say you will do. Pick a goal and break it down. Is it a career goal, a service goal, a familial goal, a relationship goal, a community goal, a financial goal, a creative expression goal, or a personal health and energy goal? Narrow your goal down further. For example, if you have a career goal, does it have to do with boosting your team’s morale, improving workflow, improving communication, etc.? Your goal can fit more than one of these narrowed-down descriptions—in fact, the more, the better! Add these narrowed-down descriptions to a checklist. Check them off as you achieve them!